Summary (from Goodreads): Since their mother's death, Carter and Sadie have become near strangers. While Sadie has lived with her grandparents in London, her brother has traveled the world with their father, the brilliant Egyptologist, Dr. Julius Kane. My Summary: Sadie and Carter are siblings who hardly know one another. After the death of their mom six years ago, Sadie and Carter went their separate ways: Sadie was raised by her grandparents in London, while Carter traveled the world with his dad, world-renowned Egyptologist Julius Kane. Neither one us particularly happy with the arrangement - Sadie wishes she could travel the world and have a relationship with her dad, and Carter has always wished he was allowed to be a normal kid. All that changes on the night their father takes them to the British Museum to see the Rosetta Stone. Within seconds of entering the museum, Sadie and Carter watch in horror as their father is sucked deep into the Earth and the stone explodes, releasing five Egyptian gods who have been trapped there for centuries. Before they can process what's going on, their long0lost uncle Amos appears, telling them some pretty crazy stories about Egyptian pharaohs and gods. Turns out it's up to Sadie and Carter to save their dad (and the world), before the evil god Set can take over the world. My Thoughts: Mr. Riordan, I don't know how you do it! Ever single book I've read by you is funny, witty, and interesting, and I'm already starting the second book, The Throne of Fire - I have no doubt it'll be amazing as well. First off, Sadie and Carter were great characters. I adore Sadie and her sarcastic attitude (she's hilarious! ), and Carter's politeness was a great contrast. I also loved that the characters were like day and night, but still made a great team (while still managing to be a perfect example of a brother-sister rivalry). I also loved the whole premise of the book; who doesn't love talking about ancient Egypt? Reading The Red Pyramid took me back to the fifth grade when I first read The Egypt Game and decided to learn how to read hieroglyphics. And as usual, Mr. Riordan managed to tie 'gods' into the structure of normal society, not trying to make things seem too unbelievable. And the writing, as usual, was flawless! 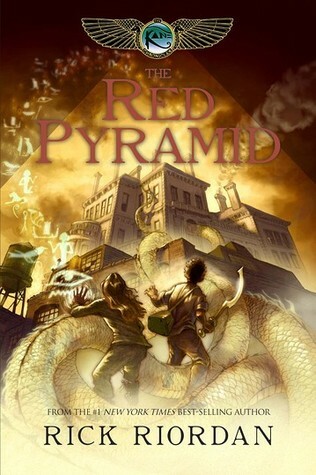 Final Thoughts: If you haven't read any of Rick Riordan's books, The Red Pyramid would be a great place to start! I highly recommend all of his books to both children (ages 8 and up) and teenagers alike. If you've ever been interested in mythology (Egyptian, Greek, or Roman) you should definitely check out one of his amazing series. I love Rick Riordian. Great review! It makes me want to read this new series :) Don't be a stranger; stop by my blog and say hi! I'm not sure if we're fellow followers, but I follow you! I loved the Percy Jackson and the Olympians series. I have been thinking about reading this one for a while but haven't got round to it...I may just have to hunt a copy down now. Love a sarcastic character! Since you are an avid reader I was wondering if I could interview you and get your insights into the books you enjoy. Let me know if you are interested in being interviewed and I will send over the questions you can fill out at your leisure. My email address is Guidedhope (at)gmail(dot)com. A Great Tool for Book Bloggers!